Video Games Have Become Obsessed With Bows And Arrows. But Which Game's Bow Is Best? If you've been playing big-budget action video games over the last couple of years, you've probably noticed a few trends. The graphics have gotten better. The animations have become more lifelike. The explosions have gotten more explosive. And more recently, amid all those improvements, has come a trend that's even more earth-shattering and important: Video games have discovered the bow and arrow. Call it the "bowification" of video games. Far Cry 3. Crysis 3. Assassin's Creed III. Tomb Raider. In just the past six months, we've had four high profile games include a bow and arrow as a primary weapon. In an impressive bit of reverse evolution, it seems video games have finally discovered the bow and arrow, decades after they discovered the assault rifle. All this goes along with pop culture's more general bow-obsession, with Katniss Everdeen using her archery chops to survive The Hunger Games and Brave's Merida besting each of her suitors in an archery contest, Robin Hood-style. Way to be current, video games! A few notes: First of all, cossbows don't count. Sorry, Dishonored! I'm going to focus on four games that are pretty recent, as they represent the current height of video game bow-and-arrow design. So, I've left off games like Turok, Wii Sports Resort, and any of the Zelda games. I've also left off a few games where the bows don't really have a mechanical component to them—my bow and arrow in Guild Wars 2 operates pretty much like a gun; same thing with Diablo III or Torchlight II. I am including Skyrim, because that game is interesting and its iteration on the Elder Scrolls' bow and arrow design is cool. If there are other video game bows you think are worthy of recognition, I hope you'll mention them in the comments. How it works: Aim and fire with the Y/Triangle button. How you cancel a shot: Press B/O. How you aim: You select a target using the aiming feature, then Connor does the rest for you. One hit? One kill with most humans, but not with animals. Better than a gun? No, not in this case. The Assassin's Creed III bow is silent, which is good for taking out guards quietly, but in general it's inferior to the game's pistols, particularly the moment you've been spotted. Aiming and firing simply takes too long to be effective. Upgrades: None to speak of. Fakest thing you can do: The more I think about it, the more I think that Assassin's Creed III's bow might be the most realistic of all the video game bows on this list. Which unfortunately seems to have contributed to it being in last place. Greatest moment: There's something to be said for hunting from the treetops in Assassin's Creed III, and the bow always felt at home in the woods. John Rambo says: "Your worst nightmare." Overall Opinion: The bow in Assassin's Creed III just doesn't feel very good to fire. The auto-aiming is strange and doesn't allow you to track a moving target, and as I've noted before, pressing "Y" (or triangle) to aim a weapon feels a bit like standing on your tiptoes to reach something in a high cupboard. There's a lack of satisfying impact, as well. How it works: Zoom with the left trigger, pull the string back with the right. Release to fire. How you cancel a shot: Click the right thumbstick. How you aim: You don't actually aim along the arrow, but rather using crosshairs on your HUD combined with a green line indicating the arrow's trajectory. One hit? One kill, provided you've got your draw-strength up for the bigger baddies. Better than a gun? Without question. It's so much better than a gun, in fact, that it makes the guns totally pointless and throws off the balance of the game. Upgrades: Your bow comes outfitted with all manner of special arrows, so they don't really qualify as "upgrades." But Prophet's bow can fire regular arrows, explosive arrows, thermite-tipped arrows that explode on a delay, and arrows that deliver a deadly electric shock. Greatest moment: The sound design on the Crysis 3 bow makes up for its odd feel—the tension of the arrow combined with the thunk of impact makes it clear that this thing is really a deadly future-weapon in the guise of a bow and arrow. Fakest thing you can do: At first I was going to say that having your arrows designed so that they'd show up on your heads-up display for gathering was unrealistic, but actually, that's exactly the sort of thing that some military weapons-designer would probably do. John Rambo Says: "I could have killed 'em all, I could've killed you. In town you're the law, out here it's me. " Overall Opinion: Prophet's bow in Crysis 3 is sort of a "bow in name only." Sure, it looks like a tricked-out compound bow. Yes, it fires arrows. But it's so powerful and futuristic that it's almost entirely removed from the more primal appeal of the weapon itself. Furthermore, because the bow can be fired while cloaked, it throws off the precarious balance struck by the first two Crysis games and makes Prophet overpowered. How it works: Aim with the right trigger, release to fire. Hit the left trigger to toggle slow-mo, if you have the ability. As a demonstration, check out this TOTALLY SICK VIDEO I just shot today. I was going to grab a screenshot to show how the bow works, but I happened to fire this arrow and... yesssss. How you cancel a shot: Press X, a welcome addition to the Elder Scrolls series, as in the past you'd have to fire into the ground and then pick up your arrow. How you aim: Right along the arrow, with a zoom-in if you've purchased the required perk. One hit? Rarely one kill, unless you're up against a weak enemy or you're firing from stealth. Upgrades: The most important upgrade is the ability to slow down time while aiming, which is a boon for those who play this game with a controller, in particular. However, thanks to the game's crafting system, you can upgrade your bow in all manner of other deadly ways. My Daedric bow shoots lightning arrows, for example. Greatest moment: Picking off an entire roomful of bandits without alerting a single one. The "bang!" sound of a successful sneak attack is never less that satisfying, and it's only heightened by the goofy way the ragdoll physics can take over once they go flying. It's also fun to peg a dragon in midair with an arrow, partly because it's such a difficult trick to pull off. Unless you're me, as evidenced by that amazing video I've already talked about too much. Fakest thing you can do: You can upgrade your bow so that it fires lightning and traps souls! God, how unrealistic. John Rambo says: "It's in the blood! It's natural! Peace? That's an accident!" Overall Opinion: While Skyrim's combat is generally not on par with the other games on this list, I actually like the bow and arrow a lot. It never quite has the stopping power I'd like it to when I've got a troll charging at me head-on, but when sneaking, there are few weapons in the Skyrim universe as deadly and satisfying. How it works: You aim with the left trigger and pull the string back with the right trigger. How you cancel a shot: There isn't a consistent way, unfortunately. You can switch arrow-types if you've got an additional arrow assigned to the D-pad, but that's an unsteady workaround at best. I have memories of being able to inconsistently cancel pulled arrows, but haven't been able to recreate that in my game. If there's a way, I'm not sure what it is. Meaning that I wind up shooting my arrows into the ground and grabbing them. You got so much right, Far Cry 3! Update: Since enough of you guys pointed out that in theory it's totally easy to cancel a shot, I thought I'd give it an even more thorough test. Looks like this issue is only on PC, or even just my PC, and it's inconsistent. I'm able to get "R" on the keyboard to cancel the shot every time, but "X" on the controller is inconsistent at best. Often it won't work at all. So, good on you for the most part, Far Cry 3—the issue isn't with your design but appears to be with your PC controller setup. Your bow is still pretty cool, though. How you aim: You can get either a red-dot sight or a more advanced hunter's sight, which accounts for drop-off. I never quite mastered the way aiming works, but I did always use the hunter's sight, even though it was more difficult to see what was going on. Better than a gun? Not really. The bow is arguably better for silent takedowns, but it's hard to top a powerful silenced assault rifle or sniper rifle, particularly if you've unlocked the later weapons in the game. That said, it's certainly cooler than a gun, and holds its own. Upgrades: You could eventually either make fire-arrows or explosive arrows. The explosive arrows were oddly underpowered, and often it took more than one to blow up a vehicle or kill a guy. Greatest moment: Hunting actual animals, actually. Some of the most enjoyable side-missions in Far Cry 3 were the advanced bow hunts, where you'd be tasked with taking down a deadly jungle beast using only the bow and regular arrows. Usually it involved finding a good vantage point and hitting shots from far enough away that the tiger/leopard in question wouldn't be able to find you. But these sequences effectively captured the thrill of creeping through the underbrush, bow in hand. Fakest thing you can do: Make an explosive-tipped arrow out of a hand grenade while under duress in the wild. Look, I get that Jason Brody has become something of a badass while on this adventure, but. 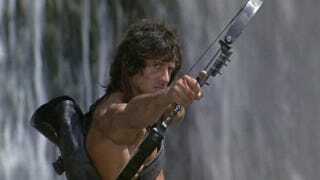 John Rambo says: "You know what you are... what you're made of. War is in your blood. Don't fight it. You didn't kill for your country. You killed for yourself." Overall opinion: The bow in Far Cry 3 is a cool, empowering weapon, and easily the game's defining mode of dealing destruction. While silenced sniper rifles can generally get the same job done from a longer range, the bow itself was my weapon of choice for the majority of the game, particularly when hunting. How it works: Aim with the left trigger, pull back the string with the right trigger. How you cancel a shot: Let go of the left trigger. Okay, hold on. This is the only game on this list to adopt this method of canceling a shot, and it deserves mention, because it's great. Initially, I was uncomfortable canceling shots this way, but only because it felt so unfamiliar. As it turns out, this is a very natural, subtly brilliant way of doing things. It's a much more accurate amalgamation of what you'd actually do if you decided you didn't want to shoot an arrow. You'd release the string. How you aim: Down the arrow using a crosshair. One hit? One kill, as long as you're sneaking or can score a headshot. In combat, it depends. Better than a gun? Absolutely. The bow is a silent killer, has a ton of non-combat uses, and is wicked powerful and accurate over long distances. Upgrades: By the end of Tomb Raider, Lara's bow has become something of a swiss army knife. It can fire regular, flaming, and explosive arrows, sure. It can also fire a rope that can manipulate objects in the environment and even attach to cliff-sides and set up ziplines. Coupled with her automated rope-retractor, she can demolish large chunks of wood and access new areas. She also uses her arrows as a makeshift melee weapon, and to skin animals after hunting. After a couple of days on the island, Lara's bow is no longer the sad little wooden thing she pulled off the corpse at the start; it's a wicked-looking high-tech compound bow with a counterweight and nasty arrows. Greatest moment: There's a sequence near the middle of the game where Lara enters a large wooded area at night. It's full of guards. The first time I played this bit, I was able to creep through the woods, silently picking off guard after guard until none were left standing. It was probably my favorite sequence in the entire game—Lara Croft as deadly predator, dealing death with a bow and arrow. Fakest thing you can do: While I value the utility, I'm not at all convinced that a bow could fire a rope-arrow into a cliff face firmly enough to let me peg that rope and climb across a chasm. John Rambo says: "When you're pushed, killing's as easy as breathing." Overall Opinion: Turns out there's a reason that Lara's bow has been featured so prominently in Tomb Raider's promotional materials—the weapon feels inextricably tied to Lara in the new game, and between the two of them, they can overcome almost any obstacle. The bow has a marvelous feeling of physicality to it, including how Lara can only pull the string back for so long before her aim starts to shake. The decision to give players the ability to hit "up" and flick Lara's lighter, igniting the arrow, was inspired. I found it telling that in the game, I used Lara's bow whenever possible, even when it wasn't the most powerful option, unless I was getting rushed by enemies on either side. Even then, whipping out a machine gun or shotgun just felt wrong somehow. So, Tomb Raider wins it by a neck. Far Cry 3 put up a good fight, but while that game does have some very fun bow-hunting, the bow itself doesn't match Lara Croft's weapon in all its upgraded glory. My Skyrim bow is all well and good, but falls short in heated combat. Crysis 3's bow is barely a bow at all, really—more of an overpowered killing device—that may be to some players' taste, but it isn't to mine. And Assassin's Creed III's bow, like so many other things about that game, is better in concept than in execution. Congrats, Lara. Take a bow. You are currently the video game archer to beat. At least until it turns out there's an awesome bow and arrow in BioShock Infinite or The Last of Us. Which, given the industry's current bow-happy state, wouldn't surprise me in the least. Update: As it turns out, The Last of Us did indeed have a bow, and it was pretty good! I've added an addendum here. John Rambo approves.